The most basic preventive aids we offer include comprehensive exams, periodic exams, thorough cleanings, cancer screenings and diagnostic x-rays. Our philosophy is based on the practice of prevention. Preventive dentistry enables us to serve you better through the maintenance and preservation of your teeth and gums in their most natural and healthy condition. We want you to keep your teeth for life. At your routine dental checkups, our dentists and hygienists are also screening for any signs of oral cancer. Through the early detection of problems and continuing education in hygiene and technological advancements, we can help you conserve time, energy and money. 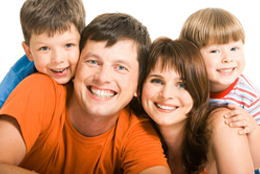 Preventive dentistry relies on good oral hygiene and regular dental care. Good oral hygiene requires an understanding of plaque. Plaque is a sticky, colorless layer of bacteria. When you eat carbohydrates you feed this plaque, which in turn produces acids that attack tooth enamel, causes cavities, and develops a hard substance called calculus. Uninterrupted, the acid attacks can result in tooth decay and gum disease. When you brush your teeth properly, at least twice a day, you are removing the plaque that causes cavities. Manual toothbrushes become worn after about 3 months and are no longer as effective. Brush your teeth twice a day with a soft-bristled toothbrush and fluoride toothpaste to remove food particles and plaque from the tooth surfaces. Brush the top surface of your tongue to eliminate breath odors and bacteria buildup. Clean between your teeth daily with floss or an interdental cleaner. Decay-causing bacteria can linger between teeth where toothbrush bristles can’t reach.Flossing removes plaque and food particles from between the teeth and under the gum line. Schedule regular check-ups to monitor dental and oral health. Visit the doctor regularly, every 6 months, for professional cleanings and oral exams.Regular dental visits should include fluoride treatments, sealant application and hardened plaque removal.